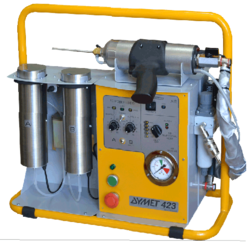 Providing you the best range of dymet cold spray equipment with effective & timely delivery. With our expertise and immense knowledge in the field, we are providing DYMET Cold Spray Equipment. The offered equipment is widely used for coating various metals like aluminium, copper, zinc, nickel, lead, etc. We engineer these products under the strict vigilance of our quality controllers who make sure that the product meets the exact needs of clients. The provided product is known for its efficiency and reliability. Further, we offer these at cost effective rates. The Cold Spray process basically uses the energy stored in high pressure compressed gas to propel fine powder particles at very high velocities (500 - 1500 m/s). Compressed gas is fed via a heating unit to the gun where the gas exits through a specially designed nozzle (level type convergent-divergent nozzle mostly) at very high velocity. Compressed gas is also fed via a high pressure powder feeder to introduce powder material into the high velocity gas jet. The powder particles are accelerated and moderately heated to a certain velocity and temperature where on impact with a substrate they deform and bond to form a coating. As with the other processes a fine balance between particle size, density, temperature and velocity are important criteria to achieve the desired coating.